and zipper-like seedhead arranged in 3-5 spikelets. 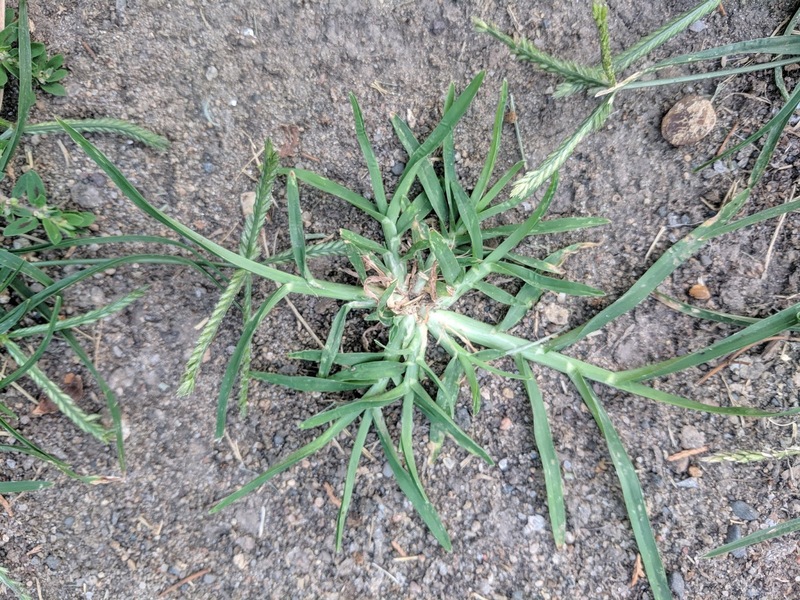 This is no more apparent than the increased incidence of goosegrass (Eleusine indica) in lawns throughout the Twin Cities compared to past years. Goosegrass is a summer annual grassy weed that is not normally a problem for lawns in central to Northern MN. Goosegrass is similar to crabgrass (Digitaria spp.) in that it can out-compete cool-season turf species in hotter and drier conditions. However, goosegrass can typically withstand higher amounts of heat and traffic stress compared to crabgrass, and is often found along driveways or sidewalks. 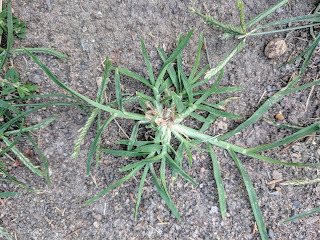 In the last few weeks, I have received several questions asking what to do about summer annual grassy weeds like crabgrass that have become so apparent in lawns. Often times weed management decisions are particular to the individual and their preferences. For those that are interested in controlling or reducing the amount of crabgrass currently in their lawn, energy is best spent preparing your lawn for next year to reduce your weed pressure, rather than attempting to control the weeds with a post-emergent herbicide. 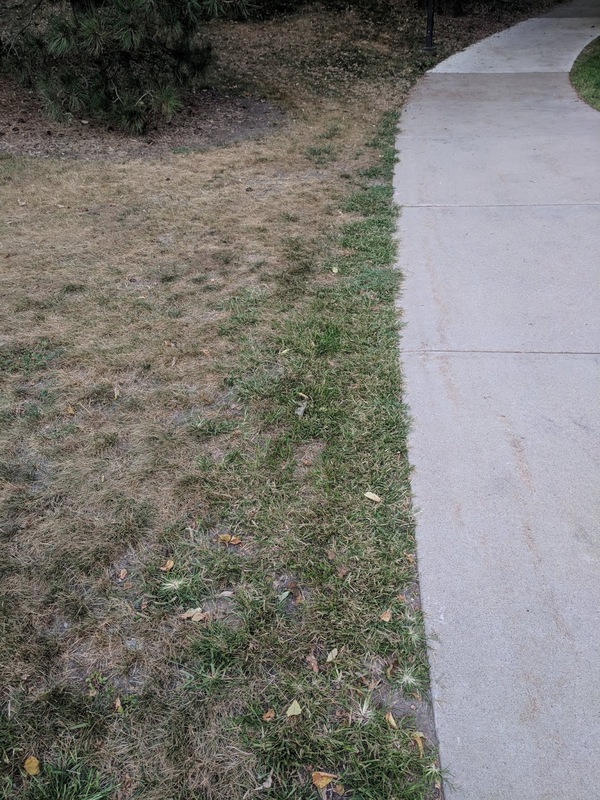 Although summer annual grassy weeds like goosegrass and crabgrass can be equally problematic in lawns, crabgrass is the predominant weed species most homeowners and turf professionals in Minnesota are concerned with controlling. Goosegrass and crabgrass are both summer annuals, meaning their seed germinates in the spring, with the plant maturing throughout the summer, and setting seed and dying in the fall. In much of Minnesota, their growth has already slowed tremendously as they are spending energy towards making seed and seedheads for next year. In most situations, killing the existing summer annual grassy weeds would be a waste of money and an unnecessary herbicide application as the plants’ growth will continue to slow until the first hard frost, when the majority of summer annual plants will die. The best defense for weeds is a dense, healthy turf, and early autumn and fall are the best times of the year to make sure next year’s weeds do not have a place to fill. Proper cultural practices such as consistent mowing, adequate fertility, aerification, and over seeding are recommended to ensure your lawn is ready for this fall and next spring. In cases with currently greater than 20% weed cover, consider overseeding to ensure all voids left by the dying summer annuals are filled prior to their germination the following spring. The last week of August through middle of September is an ideal time to begin fertilizing with the goal of a more weed-resistant lawn next spring. For more information on proper lawn fertilization, see Fertilizing lawns.